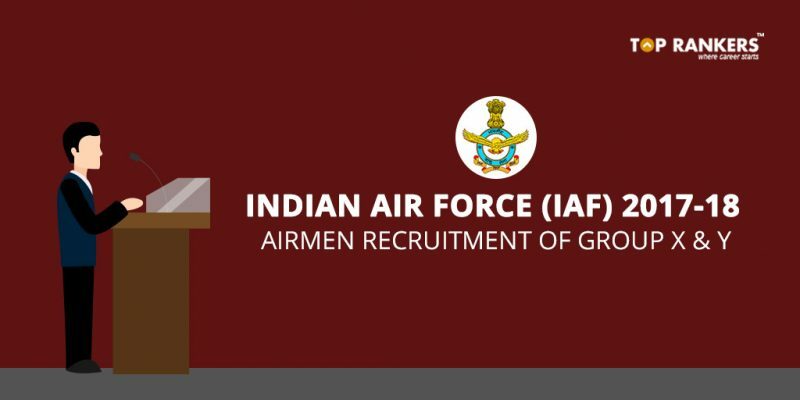 Indian Air Force Airmen Recruitment 2019 of Group X & Y – Complete Recruitment Notification, eligibility criteria, salary, application process and more. Indian Air Force (IAF) has released the notification for recruitment of Airmen. Indian air-force invites applications from unmarried male (Indian/Nepalese) to join as Airmen in group “X” trades and group “Y” trades (except automobile technician, ground training instructor, Indian air force Police), Indian air Force security and Music in trades. Selection for Airmen in Group X and Y will be based on online test, PFT and Medical Exam. (a) Candidate born between 13 January 1998 and 02 January 2002 (both days inclusive) are eligible to apply. (b) In case, a candidate clears all the stages of the Selection Procedure, then the upper age limit as on date of enrollment is 21 years. (i)Passed Intermediate/10+2/ Equivalent examination with Mathematics, Physics and English with minimum 50% marks in aggregate and 50% marks in English. (ii) Passed Three years Diploma Course in Engineering in any stream. Group ‘Y’: Passed Intermediate / 10+2 / Equivalent Examination in any stream/subjects approved by Central / State Education Boards with minimum 50% marks in aggregate and 50% marks in English. Group “Y” Medical Assistant Trade Only. Passed 10+2/Intermediate/ equivalent exam with Physics, Chemistry, Biology and English with a minimum of 50% marks in aggregate and 50% marks in English. Examination Fee: Examination fee of Rs.250/-is to be paid by the candidate while registering for the online examination. (a) Class 10/matriculation passing certificate. (b) Intermediate/10+2 or equivalent mark sheet/mark sheets (if applying on the basis of 12th/ intermediate or equivalent educational qualifications). (c) 3 Yrs Engineering Diploma Final Year Mark sheet (if applying on the basis of 3 Yrs Engineering Diploma from a Govt. recognized polytechnic in prescribed stream. (d) Passport size colour photograph of size 10 KB to 50 KB (front portrait in light background without head gear except for Sikhs) recent (taken not before November 2017). The photograph is to be taken with candidate holding a black slate in front of his chest with his Name and Date of Photograph taken, clearly written on it with white chalk in capital letters. (e) Candidate’s left hand thumb impression image (Size 10 KB to 50 KB). (f) Candidate’s signature image (Size 10 KB to 50 KB). (h) The mark sheet indicating marks in English subject (if applying on the basis of 3 Yrs Engineering Diploma qualification) in diploma or 12th/10th if English is not a subject in diploma. The candidate must have passed Intermediate / 10+2 / equivalent examination in any stream/subjects approved by Central /State Education Boards with minimum 50% marks in aggregate and 50% marks in English. The candidate must have passed 10+2/Intermediate/ equivalent exam with Physics, Chemistry, Biology and English with a minimum of 50% marks in aggregate and 50% marks in English. The Selection Procedure of Indian Air force recruitment 2019 for group X & Y is divided in three stages, where the final selection of the candidate will be made on the basis of these tests and selection will be done exclusively on merit. 1.6 Km run to be completed within 06 minutes and 30 seconds. 20 squats within the stipulated time to qualify the Test. Note: Candidates are advised to bring their own sports shoes and shorts/Track pants. Adaptability Test-1 (For both Group ‘X’ & Group ‘Y’ Trades):All candidates who pass the Physical Fitness Test (PFT) will have to undertake Adaptability Test-1 (objective type written test) which is to assess suitability of a candidate for employment in the IAF which involves deployment in varied geographic terrain, weather and operational conditions. Adaptability Test-2 (For both Group ‘X’ & Group ‘Y’ Trades): Adaptability Test-2 is to select candidates who can adapt to the environment of Indian Air Force and are able to adjust to the military way of life. Medical Examination: Candidates who qualify Adaptability Test-2 will be issued with medical appointment letter at respective ASCs. Medical Examination will be conducted by Air Force Medical Team as per IAF medical standards and policy in vogue on subject issue. (a) Group “X” Trades (Except Education Instructor Trade): Rs.33,100/- per month plus Dearness allowance (as applicable) which, in subsequent years, may rise as per the career progression of the individual. Rs. 26,900/- per month plus Dearness allowance (as applicable) which, in subsequent years, may rise as per the career progression of the individual.